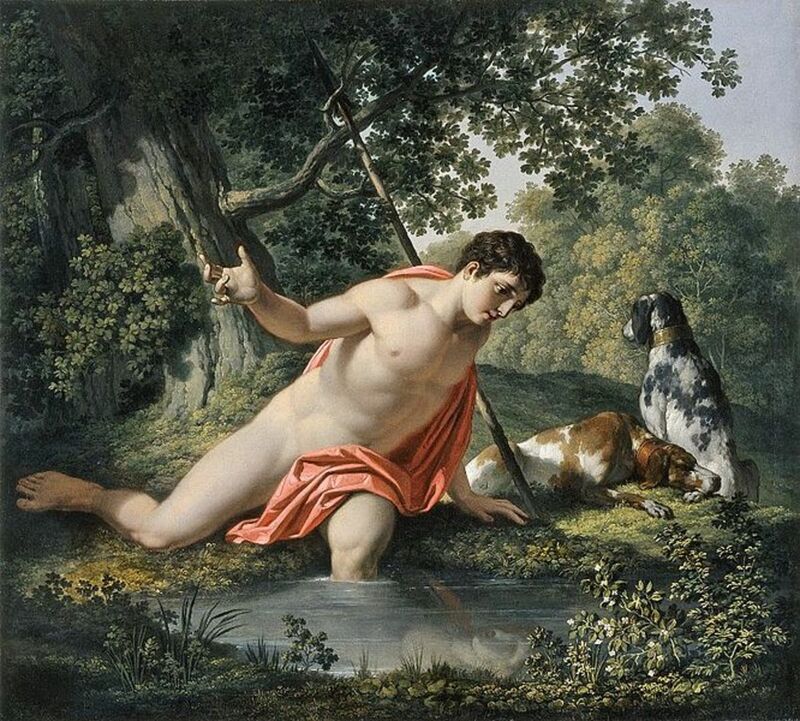 The story of Echo and Narcissus is one of the most famous stories from Greek mythology, and in antiquity the story was told and retold many times. As a result there are different versions of the Narcissus and Echo myth, although an often quoted version comes from the Roman poet Ovid. In essence the story of Echo and Narcissus is one of self love and unrequited love. 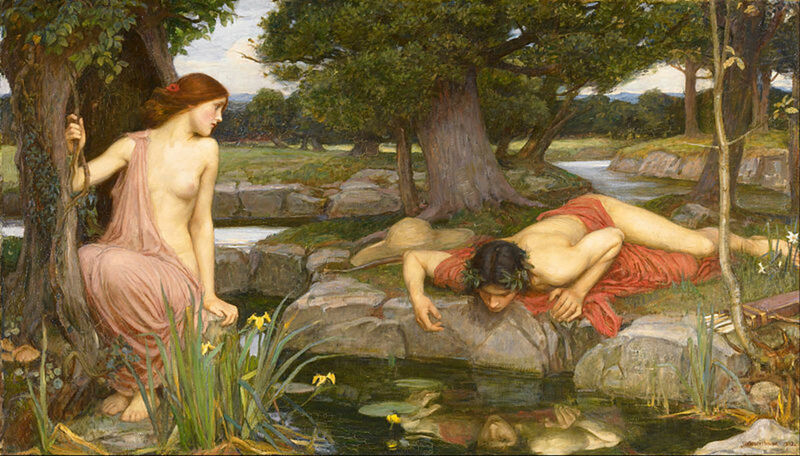 Narcissus in Greek mythology was a youth of Thespiae, a city of Boeotia, and was the son of the river god Cephissus and Liriope, an Oceanid water nymph. As he grew up he would become a hunter by trade, but Narcissus would become famous for his beauty. The beauty of Narcissus would attract many admirers, both male and female, but the Thespian youth would prove incapable of loving anyone other than himself, spurning all admirers. 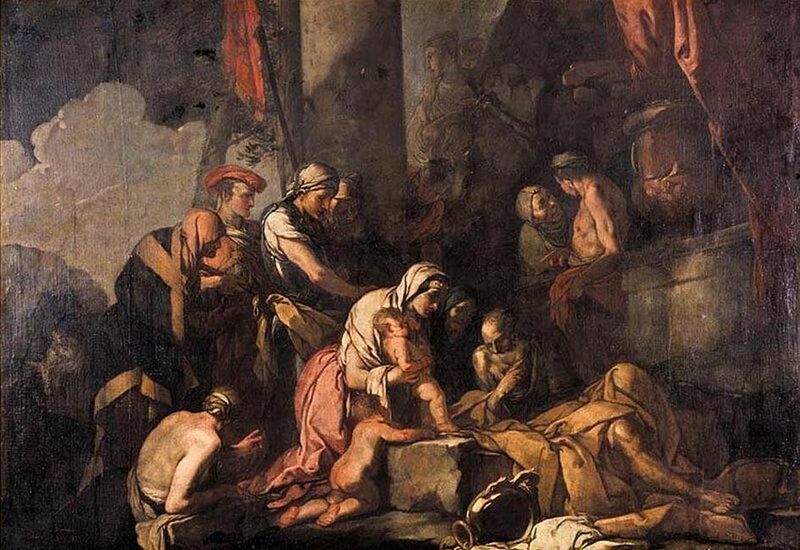 In an addition to the basic story, whilst Narcissus was still young, the blind prophet Tiresias tells Liriope that her son would only grow old as long as he does not “know himself”; some people take this warning to mean that he will remain young as long as he doesn’t look upon himself, whilst others take it to mean that he will stay young as he is not overly boastful. One of the admirers of Narcissus was the nymph Echo; and in the end she loved Narcissus with everything she had. 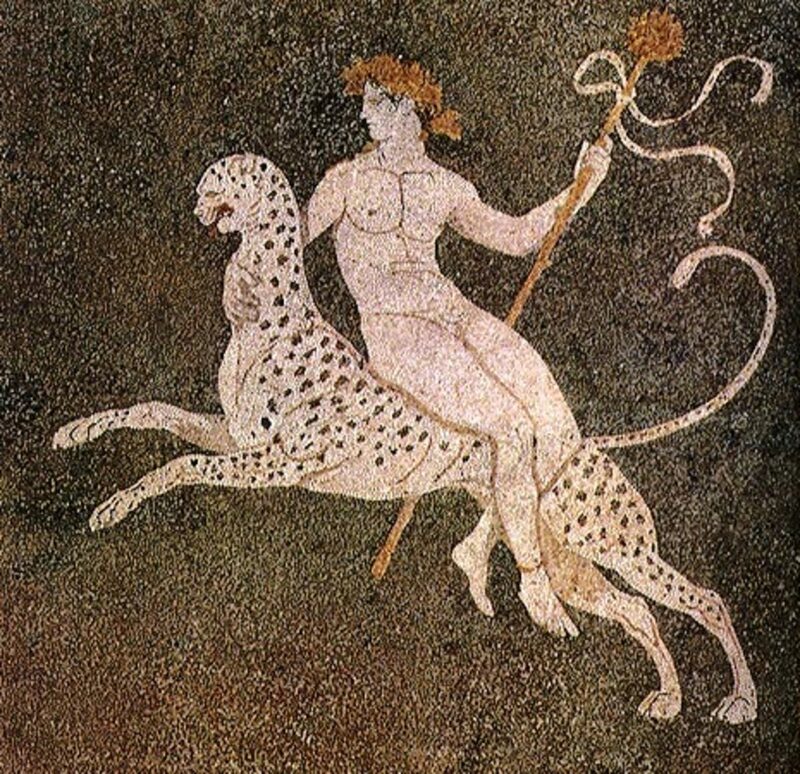 Echo was a beautiful Oreiad nymph, a tree nymph, and there was a time when Zeus cavorted with her and her sisters. 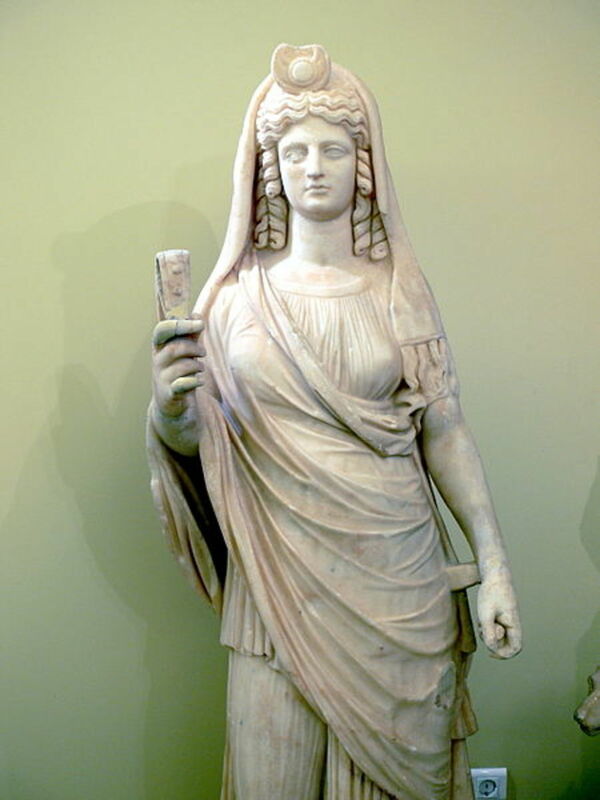 Zeus would indeed use Echo to distract Hera from his extra-marital affairs, with the nymph able to talk incessantly for hours, and Hera would love to listen to Echo. 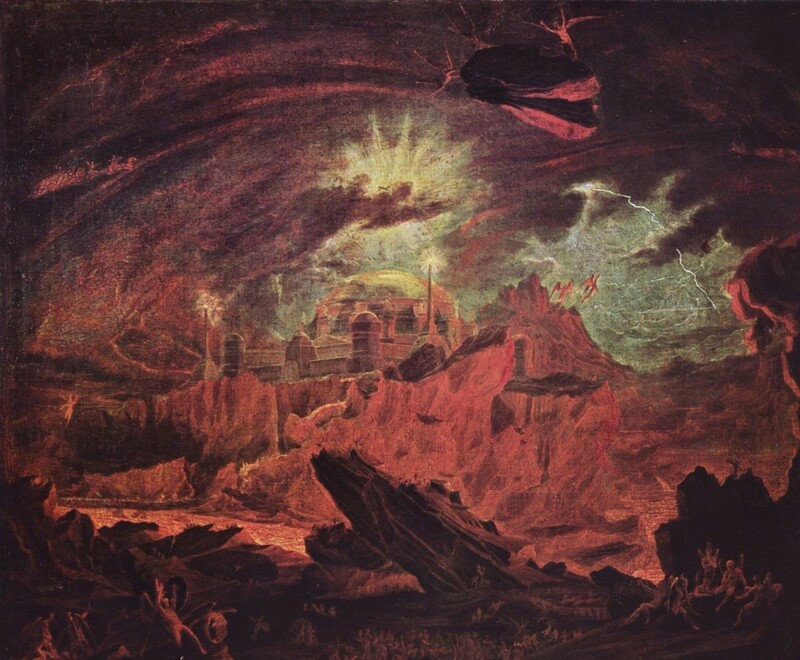 Eventually though, Hera saw through this ruse, and in retribution, the goddess cursed Echo to no longer be able to use her own voice, and was only able to repeat thereafter the words of others. After being cursed by Hera, Echo would wander the earth, until she eventually came to Boeotia, and observed the beautiful Narcissus. Echo would hide herself away, and observe Narcissus from the undergrowth, for she was unable to call out the youth. Narcissus though, would eventually sense the presence of Echo nearby, and Echo and Narcissus would eventually meet. Narcissus though would spurn Echo, just as he had rejected all those that had come before. The rejected Echo would fade away until all that was left was the remnants of her voice for she loved Narcissus so much. Another rejected suitor of Narcissus was the youth Ameinias. Ameinias, also took the rejection of Narcissus badly. The rejection caused Ameinias to commit suicide, falling on a sword that Narcissus had given him, in the very doorway of Narcissus’ home. Nemesis, the Goddess of Retribution, observed the callous rejection by Narcissus of all those who had fallen in love with him. Nemesis would therefore act on behalf of all those who had been spurned, and the goddess caused Narcissus to fall in love with his own reflection, when the Thespian youth spotted it in a pool. Subsequently, Narcissus was unable to avert his gaze from his own image, and would not eat nor drink. The Naiads and Dryads, who themselves had fallen in love with Narcissus, pleaded with him to leave the poolside, but he ignored them, and so Narcissus wasted away as he looked upon himself. 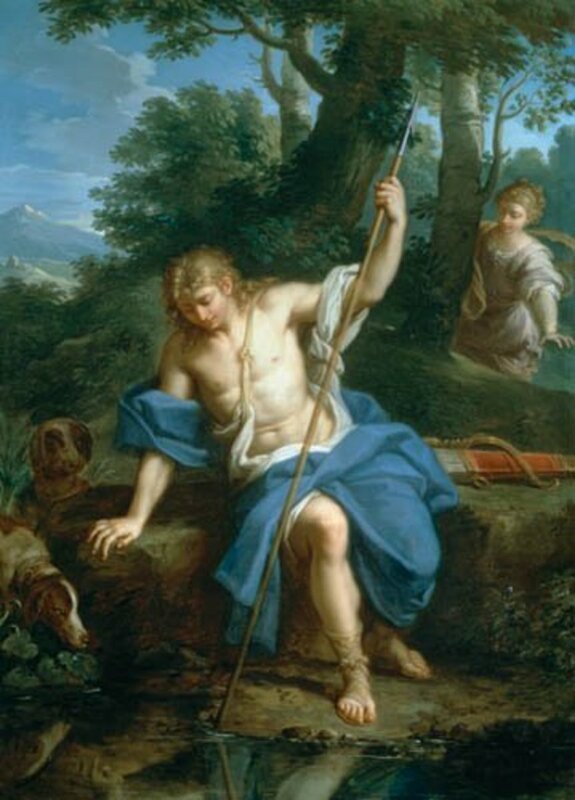 In an alternative version of the Narcissus myth, the Thespian hunter, kills himself, falling on his own sword, as Ameinias had done, when Nemesis awakens him to all the harm that he had done to others. The name of Narcissus from Greek mythology of course also resonates into modern English, with the word Narcissism; narcissism meaning “the excessive love or admiration of oneself”. 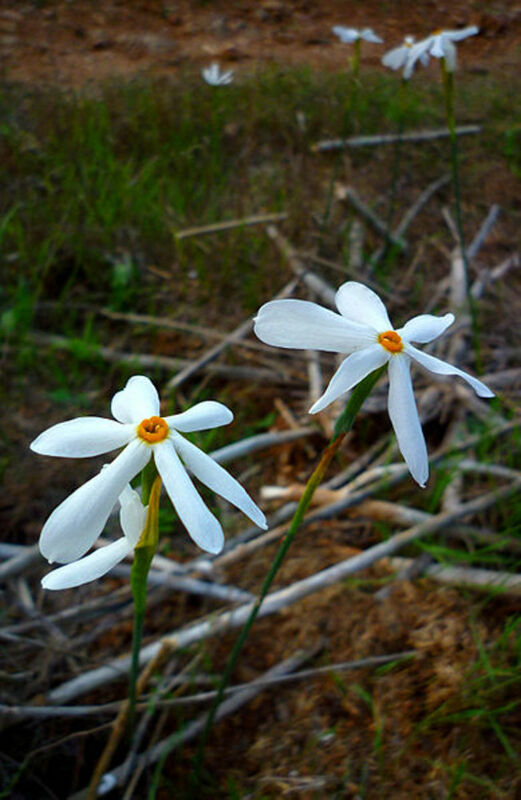 Today the name Narcissus also lives on as the name of perennial plants from the Amaryllis family. The story of Narcissus in Greek mythology tells of the metamorphosis of Narcissus into the plant; although again there are two versions to the myth. In one version of the Narcissus myth; the Naiads and Dryads, water and tree nymphs, were so distraught at seeing the beautiful Narcissus withering away that they transformed what was left of the Thespian hunter into the flower. In the version of the Narcissus myth that sees the hunter killing himself, the metamorphosis of Narcissus occurs with the blood being turned into the plant. The Metamorphosis of Narcissus is also famously the name and subject of a piece of surrealist art from Salvador Dali. The Metamorphosis of Narcissus was painted by Dali in 1937 in Paris, and can now be seen in the Tate Modern in London.